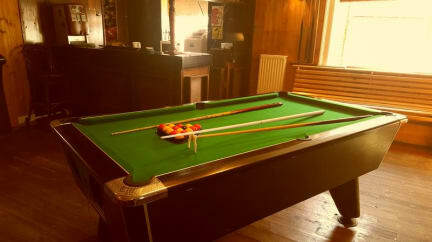 Black Sheep Back Packers is a friendly and welcoming hostel that has a bar area that serves local ale, a games room that includes pool and darts. There is also a self catering kitchen with a hob, fridge and a microwave so you can prepare your own food. If you want to chill out then why not use our residents lounge, a perfect place to relax and watch TV. When staying with us we also provide a laundry service as well as a towel hire for a small charge. If you are hungry why not check out our chefs menu with a variety of quick snacks or a sit down meal. Shared showers and Toilet facilities are available to all guests. Black sheep Backpackers is a 10 minute walk from Abergavenny town centre, Perfectly situated opposite the Abergavenny train station. Abergavenny is famous for its proximity to the Brecon Beacons and even has three mountains close by that are a lovely walk for amateurs and experienced walkers alike.The local town holds a Market Day on Tuesdays and Saturdays, and is also home to an historical castle. 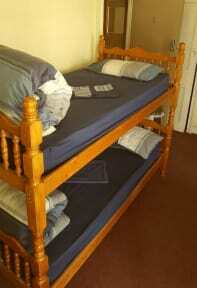 We offer dormitory accommodation with bunk beds and single beds. When booking with us, the cost of the accommodation includes a self-service breakfast of cereal, toast and a selection of spreads, with tea and coffee. Shared showers and Toilet facilities are available to all guests. Free Wi-Fi is accessible to all customers and guests. Reception is open from 12:00 to 24:00. Non smoking. We do not allow smoking in the rooms or the hostel itself. The staff was really friendly and readily available to answer questions. The full kitchen allowed us to save some money by preparing our own meals. The bar on the property was fun and drama free. Overall it was a great stay and provided better service than a previous hostel we stayed at. What can I say? The bed springs are like fists, none of the upstairs showers had showerheads, the lock had been ripped out of the dormitory door, there was a thick scent of damp in the air and I wasn't offered breakfast - but I escaped with my life and all my possessions, so 10/10. WOULD RECOMMEND. After reading the last review I was a little apprehensive about staying here, however, I needn't have worried! The hostel is very well located, clean and has everything you could need. The staff were incredibly helpful and accommodating when I realised that I wouldn't be able to check in at the right time. The hostel is good value for money, and I would definitely recommend it. Value for money. Lovely staffs. Just need to throw a stone to hit the train. I really loved the people working there! They were very nice and helpful. The hostel itself was going through a lot of renovations when I was there. So the basement area (where the kitchen and some showers were) wasn't the cleanest. Also, the door to my room didn't lock, but I felt safe enough that no one was going to touch my things. Overall, I had a nice stay. The beds were comfy, the people very nice, and I'm sure cleanliness and security will improve once renovations are completed. Property is worn down and areas dirty. Shower area was dirty and uncleaned. Carpets on stairs worn. Generally it needs renovations I wont be staying again. The biggest advantage of this hostel is the location - near the train station, a short walk from town. However, the biggest disadvantage was that it was really dirty. I stayed there with a friend for three nights, there weren't many guests, but the shared facilities were not cleaned at all during that time and it was kind of disgusting. There's a pub downstairs, so on some nights pub guests were a bit loud, but it closed at 11pm, so it wasn't too bad. Overall our stay for one night was fine. The staff were helpful and friendly but that's where it stops. There was damp on the ceiling, it was very noisy (though when we complained the music was turned down), the facilities were very basic and not that clean, and no soap in the bathrooms. I would not stay again. Complete disgrace, the manager showed us into the room so there is no excuse. There were 2 others in there who were obviously living there. The smell was unbearable, literally. We decided to pay £100 and stay at a hotel instead, We'd have paid 500, anything but stay here. AVOID. Disgusting conditions unfit for animals, let alone humans. Dirty. Yes it's across the road from the train station, but a lone female doesn't need accosting from drunk locals when paying for her room (at the pub bar). The bathrooms/kitchen are barely separate from the pub, so that was also uncomfortable. EVERYTHING was dirty. Nothing proper to wash dishes with. Dirty old appliances. Dirty bedroom floors, hostel floors + bathrooms. Even though the bed was springy, the sheets actually surprisingly smelled newly clean so I did sleep well despite discomfort.